In 1967, in the rubble of the pathetic Smile sessions and the disappointing Smiley Smile, The Beach Boys regrouped to do record an album of stripped-down, straightforward, and, most importantly, not psychedelic rock. The result, Wild Honey, was a stunning album that was undervalued in its day, but is now enjoyed for being a spontaneous act of getting back to one’s roots. (Dylan and The Beatles would do exactly the same sort of thing as well, but thanks to their rapidly descending relevance at the time, The Beach Boys receive no credit for being first.) 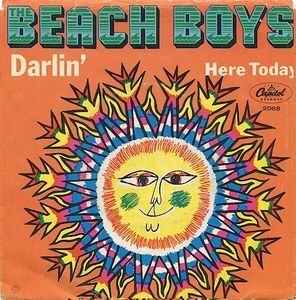 The album’s lead single, “Darlin’,” was an amazing blast of straight up Soul mixed with some potent rock and roll, and topped off with one of brother Carl’s finest-ever vocals It should have been just the thing to shake off the double-whammy of the utter failure of Brian to complete Smile and the growing image of them as has-beens…but it wasn’t, though it was briefly in the top twenty in both the United States and the United Kingdom. However…”Darlin'” was not a new song at all. In fact, it had been recorded before, by the mysterious Sharon Marie. Well, maybe not as “Darlin’,” but Brian revived the melody, rewrote the lyrics, and turned an already beautiful song into an even better one. Yeah, he’s wearing his Phil Spector influence on his sleeve, but it’s still a great little number.